There is so much more to Sintra than its wonderfully spectacular town, its surroundings are just as spectacular and extraordinary. It has a Natural Park which is located around 25 kilometres north of Lisbon and extends from the Serra da Sintra (Mountains) to the coast at Cabo da Roca. It was established in 1994 but the area has been protected since 1981. It's one of Portugal's 13 Nature Parks and has a diversity of landscapes such as forests, vineyards, sand dunes and a rugged coastline with some of the most beautiful beaches in Portugal. The perfect place for walks and mountain biking. There are plenty of marked walking trails you can take if you fancy capturing the breathtaking landscapes at your own pace, enjoying the fresh air and nature first-hand. If you follow the trail north of Sintra you'll encounter splendid green valleys and hills as well as wonderful villages, farmland, ruins and ancient bridges all the way down to the coast. This amazing beach can only be reached by car down a winding mountain road, about 3kms from the village of Almocageme which is situated a few minutes from Colares. It's very popular with the locals and therefore may be difficult to find a parking space during the busy summer months. Encircled by mountains, crevices, grottos and caves, one with an arch, its surroundings are extremely beautiful - you'll find the 'Pedra de Alvidrar' a huge rock found at the southern end as well as the 'Fojo' cave hiding a deep natural well, resulting from sea erosion. It also offers a wonderful Portuguese restaurant as well as lifeguard and sun bathing facilities. This fantastic stretch of beach is renowned for being the best surfer's beach in the area due to its large swells. It's perfect for watersport enthusiasts and the World Bodyboarding Championships is held here every August. difficult to find a space during the busy summer periods. The Sintra tram also passes by about 1km away from the beach if you wish to visit this beach but leave the car behind. A wonderfully charming little white-washed village perched on a cliff edge sweeping into a valley, formerly a fishing village. With a sea water swimming pool, a very tiny beach depending on the tide, restaurants and cafes on the rocks, it's delightfully enchanting. It also offers a fantastic viewpoint (Miradouro) on another cliff top with plenty of parking for you to stop off and admire the spectacular views. No lifeguard facilities available. If you're after peace and quiet, this beach is perfect. It doesn't have any facilities but plenty of parking. Its real downside, however, is that it can only be reachable by a set of steep stairs down a cliff-face which you may find challenging. Stemming from the mouth of the river 'Ribeira da Mata', this gorgeous, long stretch of beach dotted with rocks is very busy and offers a number of facilities including cafes and restaurants. It also has a geological monument in the form of a fossil dune for visitors to admire. Again, parking is difficult during the summer season. As an alternative to driving, you can also take the historic 100 year old tram from Sintra, at Estefania - next to Sintra's Museum of Modern Art, to the coast. 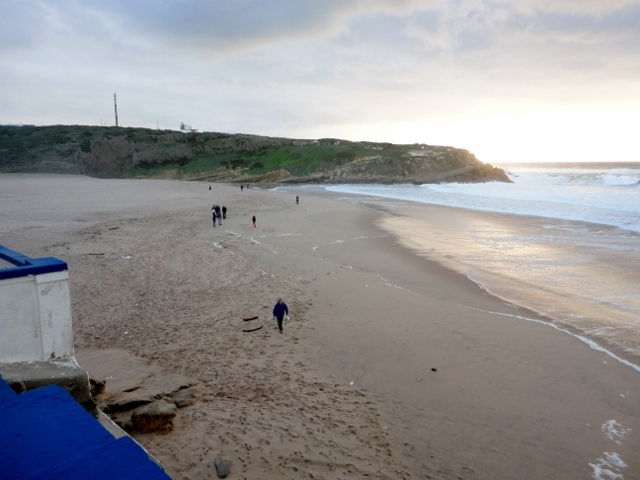 It travels via Colares and stops at Praia das Macas. Although it's a rather slow journey, it's wonderfully picturesque travelling through beautiful green valleys and charming villages. The Sintra coastline is magnificent and is filled with many splendid golden sand beaches, secluded coves and even dinosaur footprints. It's ideal for swimming, fishing, surfing, paragliding and bodyboarding - here's to name just a few. But always take much care, many of the beaches are not manned, the waters are very strong and cliff climbing, cliff-edge sightseeing can be very dangerous. With a reputation for being the most stunning beach in Portugal due to its beautiful gigantic rock formations, one which looks like a bear, hence the name 'ursa' - you may find yourself sharing it with the odd naturist or two, as its main visitors are nudists. It is surrounded by glorious cliffs but offers no facilities and can only be reached by foot from Azoia - parking is around half an hour away. Most importantly, at the end of the Praia Grande stretch, 66 dinosaur footprints have been discovered on the cliff-faces dating back 170 million years - it's definitely worth the climb. 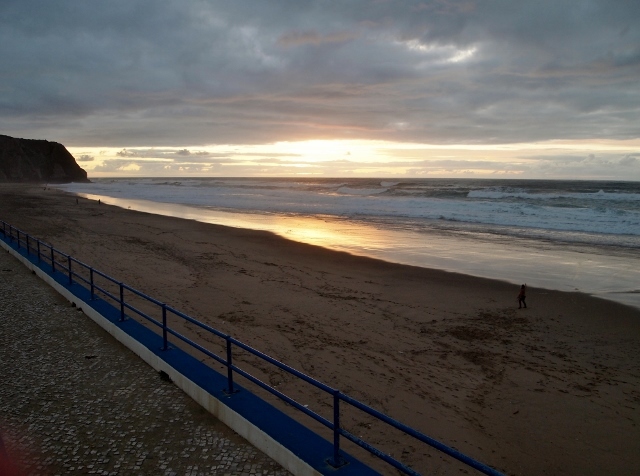 This marvellous beach is situated just north of Praia Grande but is the complete opposite. It's much smaller in size and much quieter so if you want to get away from it all, it's the perfect alternative. It doesn't, however, offer any facilities, just free parking. This gorgeous village beach has become a very popular tourist resort. It has the usual lifeguard and sunbathing facilities, outdoor tennis courts and saltwater swimming pool, water sports such as surfing, bodyboarding and fishing, a children's playground and picnic area as well as plenty of restaurants, cafes, bars and shops. 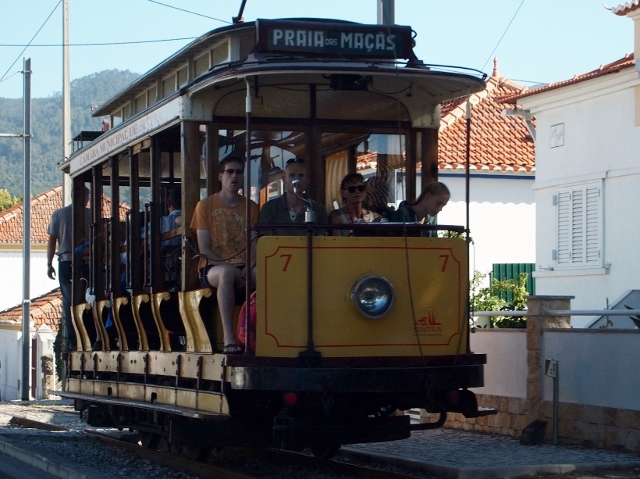 The Sintra tram's final stop is at Praia das Macas sea-front, good news for those who'd prefer to leave their cars at Sintra instead as a parking space is a tad difficult to find during the very busy summer months. 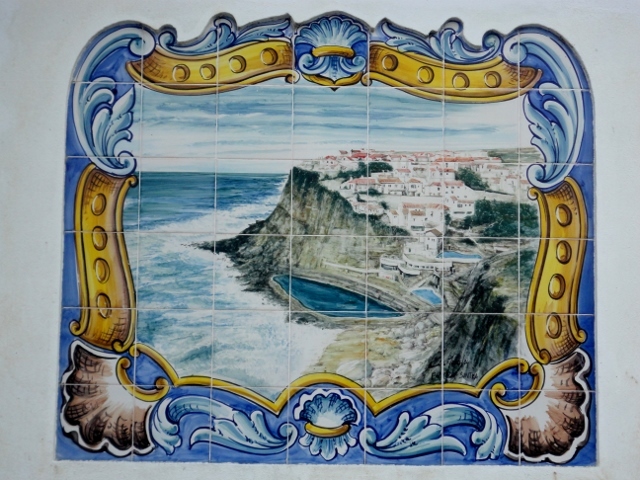 Is a charming little town on the way to the coast from Sintra. It has several lovely hotels, restaurants, cafes and bars as well as gorgeous beaches nearby. 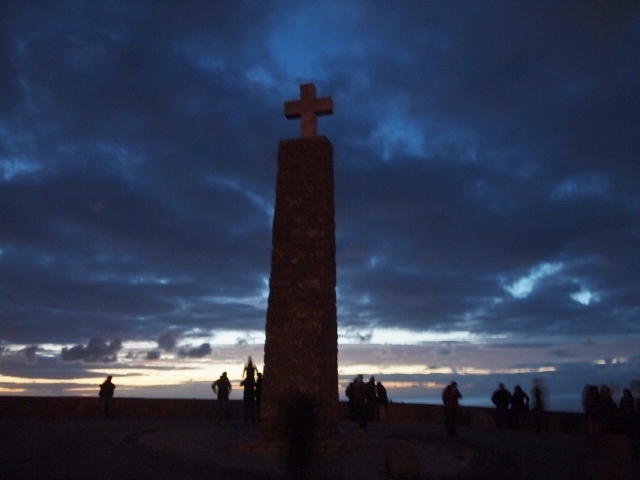 on the rugged cliff edge, bearing an inscription by the Portuguese poet Luis de Camoes 'Land ends and sea begins'. You will also find a restaurant, cafe, souvenir shop, a tourist office and lots of free parking. Offering the most phenomenal views, it's the perfect place to see a sunset with the sounds of crashing waves below.